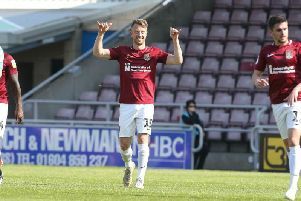 Cobblers manager Chris Wilder says he is aiming to ‘run with a squad of 21 or 22 players’ at Sixfields next season. The Town boss’s recruitment drive is already in full swing behind the scenes, and he is going to be a busy man as he is currently looking at a contracted squad of just 10 players for next season. There are actually 14 players under contract, but Wilder has transfer-listed John-Joe O’Toole and Chris Hackett, and has intimated that youngsters Sam Warburton and Danny Clifton will be sent out on loan to gain experience of senior football. Wilder has also stated he will be looking to bring in two or three long-term loans, and that means he will be looking to sign nine or 10 new contracted players in the next six weeks or so, including two goalkeepers. And the Town boss says he is ‘itching to get going’. “It is always difficult as a manager when you come in and you inherit players, and some stay the course with you and some you have to make decisions on,” said Wilder, who released seven players at the end of last season. “I am not saying every decision we have made over the past 12 or 15 months has been spot on, but we feel we have an exciting period ahead of us, and there is a lot of optimism from the stands. “There is always disappointment when we don’t produce, but on the whole, especially at home, we have produced some front-foot and exciting performances, and we know we can win matches in this league. “We know we have some work to do, and as always we are itching to go again. “Last season was a long season full of lots of emotions and ups and downs, but we will be refreshed and raring to go in the summer. “We will add some exciting players to the group we have, and we are looking to run with possibly 21 or 22 players, and we feel we have a lot going for us.